Stack Snippets are pretty sweet. I find myself using them more and more, where I used to use JSFiddle or Codepen. Kudos to StackOverflow for implementing. And yet, I still find myself coding JSFiddle, then pasting my code into the snippet. Why? Because JSFiddle has an awesome Tidy button, that turns my horrid code into an amazing piece of art. 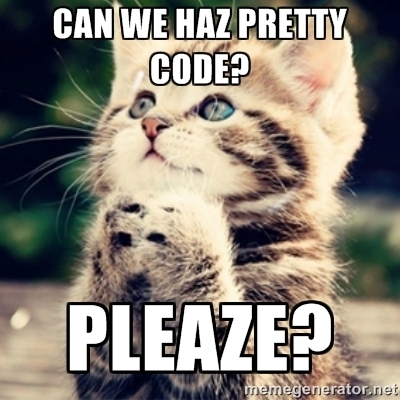 So, my request is, Why can't we have code beautify in Stack Snippets? Snippets are used to display the source code and provide a demo at the same time. Since the purpose of an answer is to provide a solution, and help the OP understand their problem, the logical decision is to make the questions as easy to read and understand as possible. The code doesn't need to look like it was made in notepad. Not as important, but you find it all the time where people edit a question/answer to provide the correct formatting. While this might be considered a trivial edit to some, it defiantly shows that users prefer pretty code to ugly code, I especially do. I am sure there are plenty of others reasons that could be found, but I think the above is enough to justify adding a button and a beautify script (Alright, it might be a bit harder). Can we please add code beautify to stack snippets? 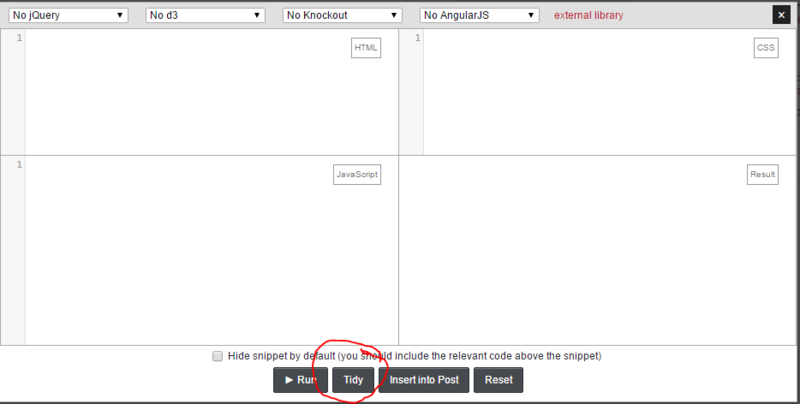 Stack-Snippets™ already have a tidy button. If you're talking about a tidy button for the post editor, rather than the Stack-Snippet™ editor, you might want to amend your question to clarify that.